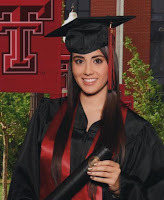 Former South Texas College student and Rio Grande City native Monique Estelle De Pau earned her Bachelor of Science Degree in Human Development and Family Studies from Texas Tech University College of Human Sciences in May 2011. She is currently pursuing a master’s in occupational therapy at The University of Texas Medical Branch in Galveston, Texas. But she believes she would not be where she is today without the academic boost she received from STC and her own hard work and determination. Monique also took advantage of STC’s summer courses to get ahead when she came home from school to spend time with family and friends. In addition to her academic excellence, Monique prepared for her future career by volunteering at local clinics and shadowing professionals in the field to learn about the different methods practitioners use to solve their patients’ problems. She looks forward to returning to the Valley upon earning her master’s degree to make a difference in the lives of Valley children and families. And what advice would she give to other students considering taking dual enrollment classes while in high school? Former STC student Monique Estelle De Pau earned her bachelor’s degree from Texas Tech University in May 2011.